The Peter Parker Spider-Man will be back in black this April for Symbiote Spider-Man, a five-issue limited series set before the web-slinger learned his updated costume was a living extraterrestrial creature, Marvel Comics announced Friday. Scribe Peter David (The Incredible Hulk, Ben Reilly: The Scarlet Spider) and artist Greg Land (Ultimate Fantastic Four, Uncanny X-Men) team for the all-new, in-continuity tale that will revisit the classic era of the alien costume, set post-Secret Wars, pitting Spider-Man against famed foe Mysterio. 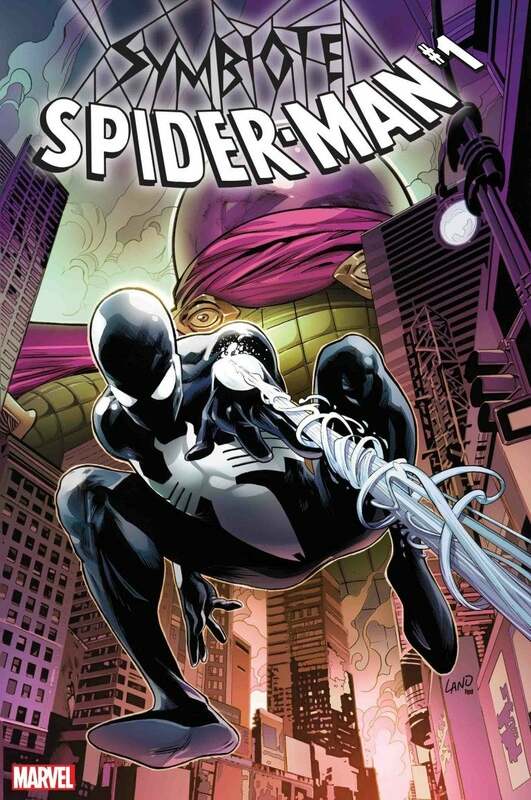 “Venom may be my day job and favorite Spider-Villain, but my favorite fictional character of all time is the one and only Spider-Man – and far and away, this is one of the most exciting projects I’ve ever had the privilege of working on in my five and a half years here at Marvel,” said editor Devin Lewis. Mysterio’s involvement coincides with the trickster super villain’s big screen debut in this summer’s Spider-Man: Far From Home, the Marvel Studios-produced blockbuster starring Tom Holland and Jake Gyllenhaal. “He never fought Symbiote Spidey! Or did he? !” Lewis teased of the classic Spidey foe, whose fishbowl-shaped figure can be seen ominously looming over New York City. David has a long history penning Spider-Man — including issues that saw the superhero suited up in the symbiote costume that would go on to turn against him and emerge as archfoe Venom — famously scripting the death of Jean DeWolff saga and writing numerous issues of various Spidey titles, including Amazing Spider-Man, Peter Parker, The Spectacular Spider-Man, Web of Spider-Man, Friendly Neighborhood Spider-Man and Spider-Man 2099, which he co-created. Symbiote Spider-Man #1 releases in April.